Since the 1920's, Sunset Hills has housed Hollywood elite and the architecture reflects the privacy that those types desire once they retire to their own home. Often, only a gate is visible from the road and most will never even catch a glimpse of the $5 million or $20 million dollar home just behind it. Sunset Hills is perched above a thriving retail and culinary stretch of Sunset Boulevard. You love city views - Yes, the views here are staggering. You'll never forget you're in Los Angeles as you look out on downtown to the east and the Pacific Ocean to the west. At night, the city lightscape is the stuff that dreams (and postcards) are made of. You like your privacy - Many of the multimillion dollar homes in the neighborhood are expertly tucked away, so that passers by and nosy neighbors can't steal a glimpse onto the grounds. Usually they were built with celebrities and the uber wealthy in mind, who want nothing more than utter privacy when they park their cars behind their heavily secured gates. You want easy access to upscale shopping and restaurants - Katana, Yatai and Chateau Marmont are just a few of the upscale dining experience to be had down on the Sunset Strip. As for shopping, on the west end of the strip, you have Sunset Plaza. To the East, you have the stylishly renovated outdoor mall at 8000 Sunset, featuring a Burke Williams Spa, Veggie Grill, Crunch Gym and Trader Joe's. You don't mind driving a bit to find some flat, green space for you or your kids - Sunset Hills offers beautifully landscaped grounds at most every home in the area, but it sorely lacks in community parks. There is a dog park on Sunset near Kings Road, but little in the way of playgrounds or picnic areas. 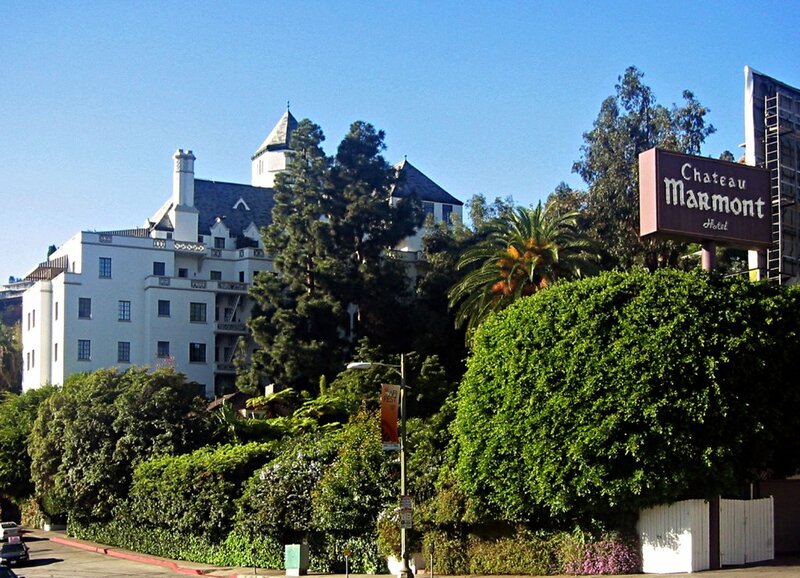 Chateau Marmont (8221 Sunset Blvd) - Harry Cohn, founder of Columbia Pictures, said "If you must get in trouble, do it at the Chateau Marmont." This upscale, charming, French-inspired hotel, bar and restaurant is go-to for tourists, locals and celebrities who want to be seen and have more than a little fun while doing so. Whisky A Go Go (8901 Sunset Blvd) – Celebrating its 50th birthday in 2014, the Whisky is a rock music institution that still knows how to party every night of the week. The Doors, Led Zeppelin and Janis Joplin all played here. Nowadays, you're more likely to catch tribute bands, local rockers and lone remaining members of famous bands. Storer House (8161 Hollywood Blvd) – Considered one of Frank Lloyd Wright's masterpieces, this house was said to resemble a Pompeian Villa. It is part of the National Register of Historic Places and is one of four “textile-block” houses he built in Southern California. Sunset Boulevard (1950) – You'd never know it today, but the famous Schwab's Pharmacy featured in Sunset Boulevard was at the corner of Sunset and Crescent Heights. Now, it's where you can work out at Crunch, watch an indie flick at the Sunset 5 or shop for home goods at CB2. The Sunset Hills are not for the budget conscious. Homes range from around $2 million up to and above $10 million. The most coveted streets are all named after birds: Blue Jay Way, Skylark Lane, Thrasher Avenue and Warbler Way. Know that if you get into a bidding war for a house in this neighborhood, you'll likely be competing against a Hollywood A-lister.